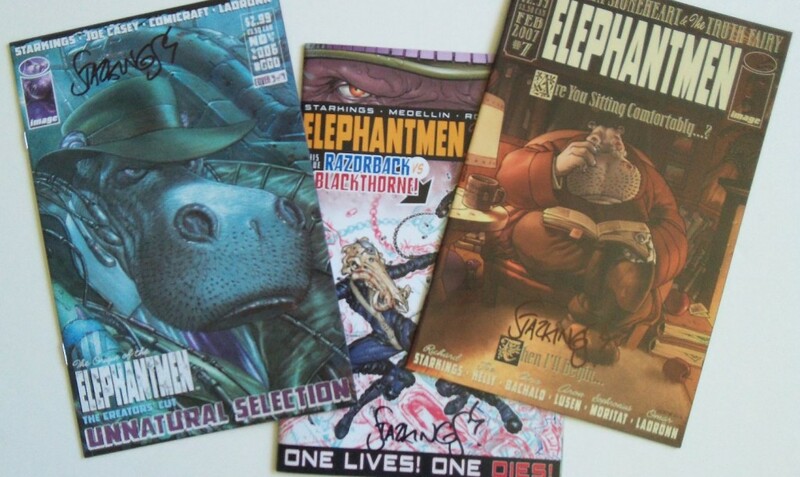 Courtesy of Hip Flask, we have a set of three AUTOGRAPHED Elephantmen comics by writer/creator Richard Starkings. Included in the set are Elephantmen issues #000, #7 and #38. 2259: Hip Flask, Ebony Hide and Obadiah Horn are Elephantmen; human/animal hybrids and survivors of a war fought between Africa and China over the European countries ravaged by the deadly FCN virus. That war is long since over and over 15,000 Elephantmen have been rehabilitated by the United Nations and scattered throughout the globe to live peacefully among humans. Flask and Hide work for The Information Agency as crime scene investigators, while Horn is the Chairman and CEO of Horn Industries, a global business dealing in imports, exports and real estate development. Perhaps the most celebrated Elephantmen of all, Horn’s lifestyle, outspoken manner and his engagement to U.N. refugee spokesperson Sahara, have made him the subject of intense scrutiny by the media. Some suspect that his business dealings are not entirely legal, and it is true that those who speak out against him have been known to disappear without trace, or die in mysterious circumstances. Sahara’s father, Joshua Serengheti, a Los Angeles-based crimelord, would be happy for Horn himself to die in mysterious circumstances. Hank Gruenwald, director of the L.A arm of the Information Agency, has assigned Information Agent-in-training Vanity Case to help keep Hip Flask out of trouble, but perhaps overlooked Vanity’s own tendency for getting into trouble… recently the Elephantmen found themselves embroiled in a plot hatched by agents of MAPPO, the sinister corporation that created them. Two repurposed SIMM androids attempted to reactivate both Flask and Horn, but were ultimately unsuccessful. Seemingly content with his role in the world of humans, Hip has befriended a young cab driver by the name of Miki… their relationship has become increasingly intimate, and when last we saw them together in Hip’s apartment, Miki spent the night. Read issue #1 online HERE for free!